Victimless Leather, is artistically exploring and provoking notions relating to human conduct with other living systems. Victimless Leather looks at deconstructing our cultural meaning of clothes as a second skin by materialsing it and displaying it as an art object. Victimless Leather also presents an ambiguous and somewhat ironic take into the technological price our society will need to pay for achieving “a victimless utopia”. Whilst Second skin is not looking at directly confronting people with ambiguous or ironic takes on society and technology or displaying work as an “art object”; Second Skin will be looking at taking this notion a step further and addressing embedded technology and our need to be connected and in touch with technology. Second Skin is looking at pseudo science approach and the imagery of Victimless leather is appealing in the context of growing a garment in a science lab. Whilst Victimless Leather has grown a new skin but destroyed the host in order to create and sustain the new skin. Ideally Second Skin will not destroy the host but allow it to continue to grow or evolve. On a side note, I have proven this theory with my first samples, the scoby will regenerate when rehydrated. This is why I have also looked at another works that may allow for sustainability. 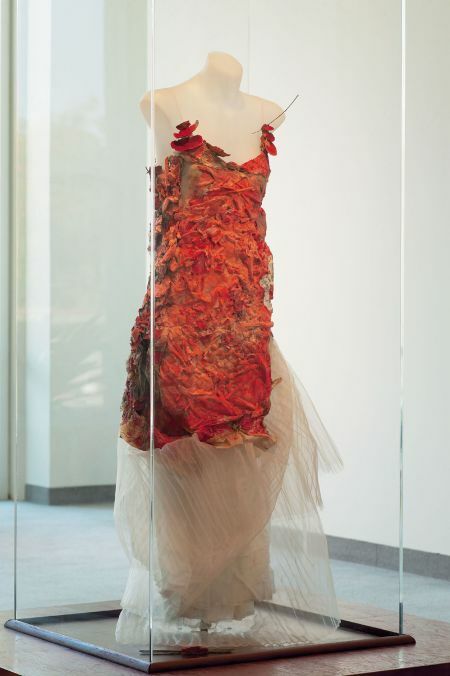 Fibre Reactive is a organza evening dress that is a base to be ‘colonised’ by a fungal growth, the orange bracket fungus. 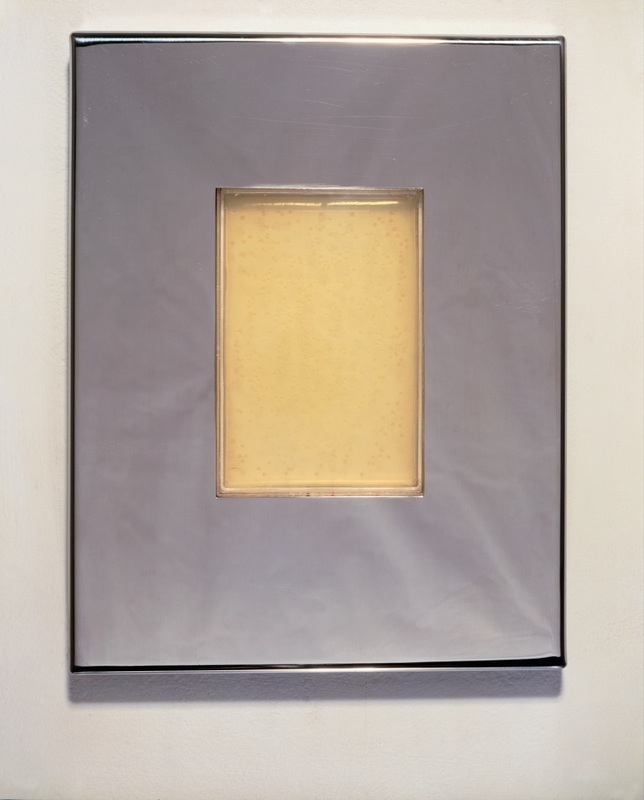 The elegance of this work overlays a subtle examination of the bio-technological manipulation of living things. Wearing the dress places the wearer in the position of a guardian the orange bracket fungus and creates a relationship between both lives, questioning the disposability with which we treat nature. The notion of colonising is appealing in the context of Second Skin as the Scoby is a living bacteria that is feed sugar and tea. One of the aims of this work is to encourage the scoby to “colonise” layers of cellular fibres in order to create a “wicking” effect for the wearer. The reason I am investigating a wicking” effect is to draw the wearers natural body moisture away from the garment so as to prevent rehydration of the scoby - thus avoiding a slimy feel to the garment in the areas affected by the perspiration. This is only a very small sideline of interest in the bigger project. The question that Fibre Reactive raises about disposability with which we treat nature is relevant in my own practise and ethics. 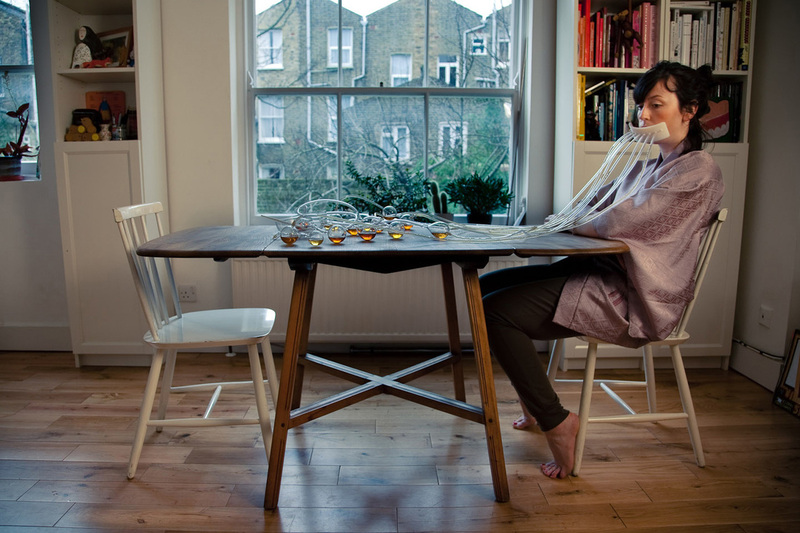 Work done by London-based Suzanne Lee, ‘biocouture jacket’ is not woven, knitted or felted, but made with a textiles formed from a symbiotic culture of bacteria and yeast (SCOBY) in kombucha. This is what will form the base of second skin for this body of work. The nature of the Kombucha scoby lends itself to Second Skin as the scoby is regenerating and sustainable. 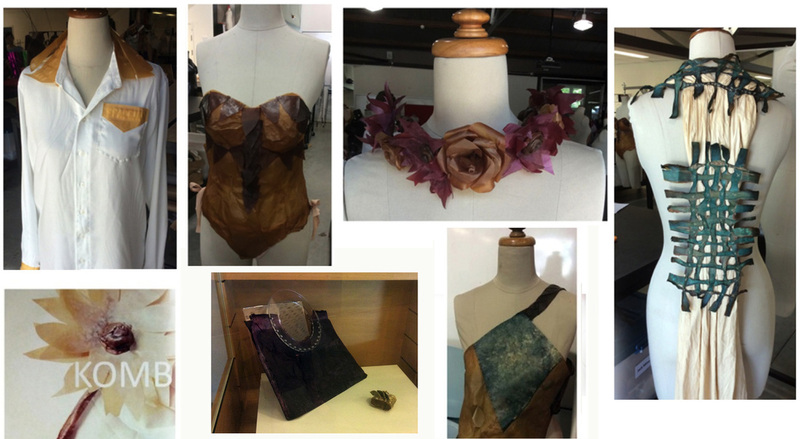 Work undertaken at QUT during 2014 has also experimented with Kombucha and their work will also be looked at as they did a series of wearable experiments with Kombucha. I am interested in contacting both Suzanne Lee and QUT with a series of questions about their work, ideally to fast track my work and avoid similar errors or recognise limitations of the scoby. In order for the wearable scoby to communicate I have looked at advancements in technology. Therefore epidural electronics such as the prototype by John A. Rogers, a professor of materials science at the University of Illinois at Urbana-Champaign are also of interest. 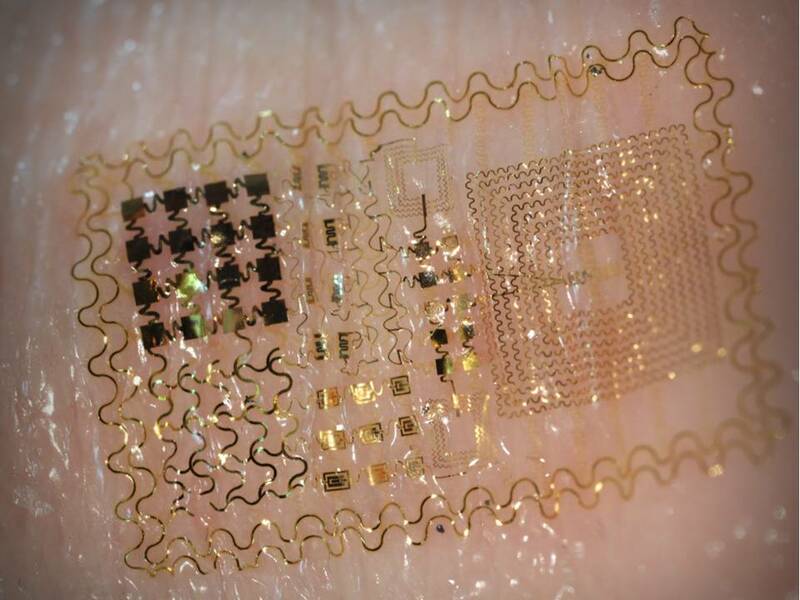 The prototype is a stretchable, ultrathin electronic membrane that clings to skin like a temporary tattoo and can measure electrical activity from the body. There is also work currently being done by computer scientists at Saarland University. The work they have produced however is a flexible silicone rubber sticker with pressure-sensitive sensors. 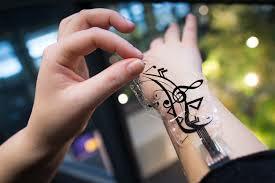 The work done at Sarrland University is of interest as it is reasonably easy to replicate and has taken design into consideration, Such as the tattoo like musical notes used to indicate the areas that are interactive. Where as the work done by Rogers is purely functional. Rogers work in my eye is more elegant, the technology used to communicate is more subtle. The work reminded me visually of the Marc Quinn, D.N.A portrait of Sir John Sulston. 2001. The work is not visually confronting, unlike the work of Catt and Zurr yet it is redefining the communication of a portrait. This work has led me to question maybe the communication that is used in second skin is not obvious – maybe it is QR codes grown into the textile? Or other methods of communication? Neuroscientist David Eagleman has designed a vest that will let the deaf "hear" and allow wearers to sense what is happening online without looking at a computer. This work was presented at a TED gathering March 17, 2015 in Vancouver, BC, Canada. 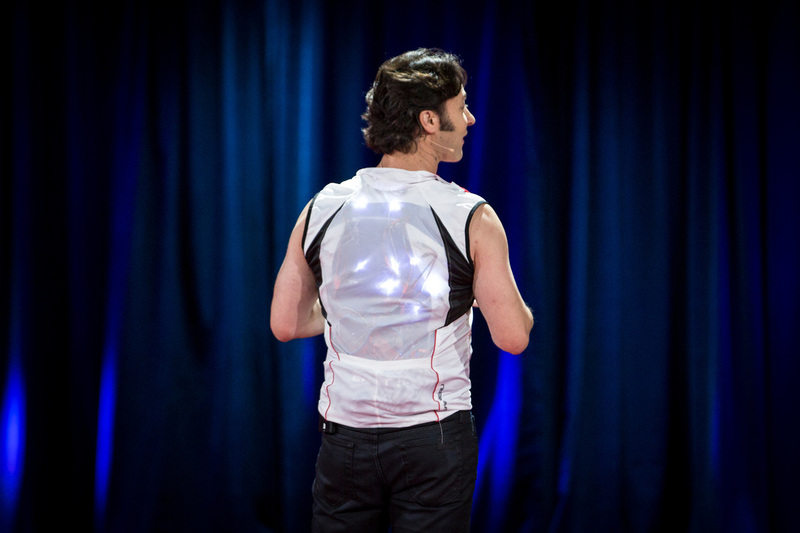 during this TED talk David received real time tweets to the vest - causing the vest to vibrate. The work by Eagleman asks is it possible to feel information? Can we experience data the same way we hear, see or feel other things? What would a world where we’re not limited to our five biological senses be like? This got me thinking me about methods of communication, particularly the quotes below from the TED talk. I will address Eaglemans work further in the next paper. 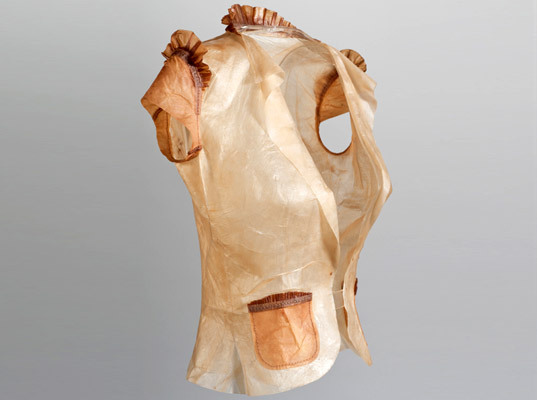 But his work has certainly influenced how and what the wearable scoby may be used to communicate. I also started looking at different ways skin is reproduced and came across a printer that can reproduce skin. This idea of a printable skin has opened up other ideas. 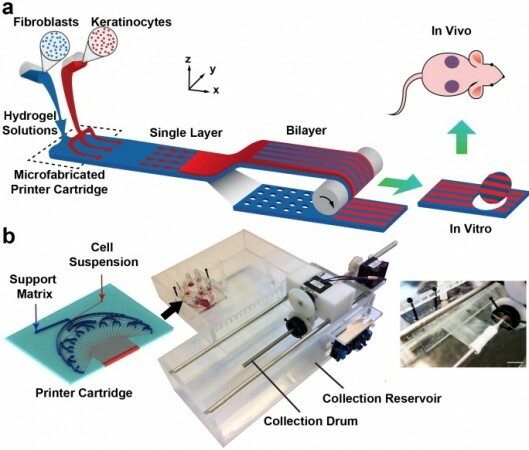 PrintAlive - the machine was developed by University of Toronto engineering students Arianna McAllister and Lian Leng, who worked in collaboration with Professor Axel Guenther, Boyang Zhang and Dr. Marc Jeschke, the head of Sunnybrook Hospital's Ross Tilley Burn Centre. The machine prints the patient's cells out in patterns of spots or stripes rather than a continuous sheet, to make them go further. The result is a cell-populated wound dressing that reproduces key features of human skin and can be precisely controlled in terms of thickness, structure and composition. 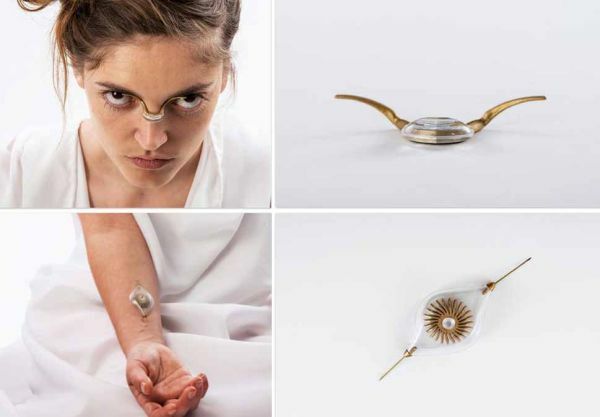 The wearable item could be programmed to give you your social media feeds. The wearable item would use WiFi to keep you up to date with emails etc. 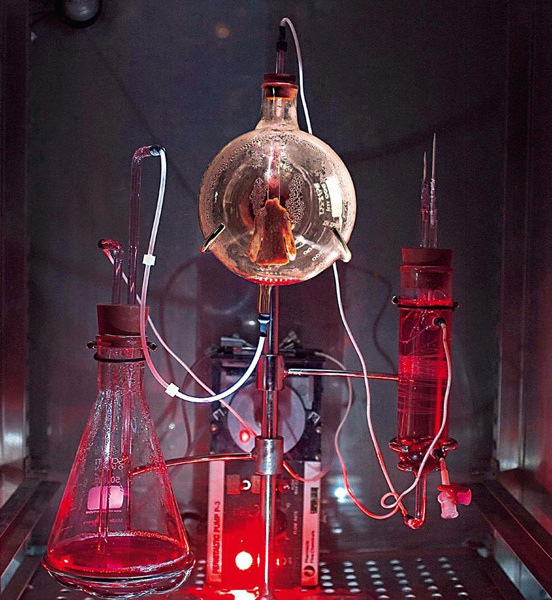 Alagculture (2010 2012) By Michael Burton and Michiko Nitta. And the Near Future algaculture symbiosis suit. Are an interesting look at genetically modified foods and their sustainability. The work looks at redesigning how we fuel the body. The Scoby is a living organism that needs feeding before it becomes wearable. The work of Burton and Nitta is interesting as not only does it address sustainability but also visually, whilst a little confronting does look at a wearable work that creates a lifecycle - your breath feeds the algae that you eventually eat. This did have me thinking that maybe Second Skin becomes a growth that feeds from the wearer, but in a more subtle way. I have also looked at Synthetic immune system (2010) – Tuur Van Balen and James Chappell. This is a tailored immune system – or perhaps even an external immune system. The idea was to make your healthcare more personal and allow you to become your own Dr/pharmacist – constantly monitoring and tweaking your body’s immune system. The synthetic immune system would need feeding every evening to produce your needs over night. Diagnosis would be made via a drop of your blood when feeding each evening. The Scoby for Second Skin needs feeding and as an interactive technology would also need data input the three works mentioned above all look at human interaction to sustain a living organism that has perceived benefits to the host. These elements will be explored in Second Skin. The synthetic immune system along with the PrintAlive system (mentioned above) are two very different looks at ways of being able to feed and grow an organisim. They both look at human interaction and customisation. These elements of Second Skin are still being explored and will be resolved, I hope - or open more questions. 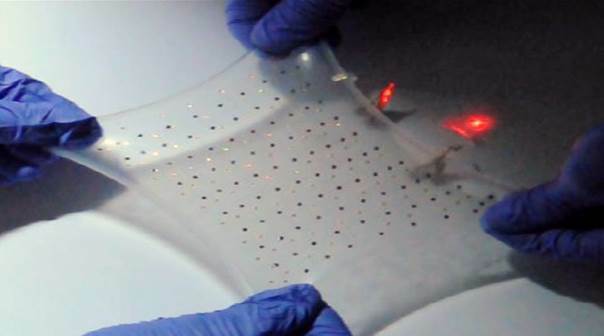 Advancements in technology are at a point that a stretchable lithium battery has been developed. This is also visually similar to the work done by Rogers and Quinn. these advancements are exciting as previously large and obvious power source was needed. This means that if the communication methods used in Second Skin needed a power source, then it is possible to have a power source that is hidden and embedded into the Skin. Another look at a power source is the work of Naomi Kizhner. Maybe the power source for Second Skin is not hidden but is decorative? The Practitioner Review has addressed works that have grown new skin in sustainable and non sustainable means. Looked at colonising a host, host interaction with the organism. Looked at actual advancements in Science and technology so that Second Skin may address these if necessary or at least acknowledge these advancements. Started to address the aesthetics of Second Skin - will the technology be obvious or hidden? Plus questioned what and how the communication from a Second Skin will be. It would be easy to create a non woven wearable textile from the scoby. Whilst it does have limitations regarding rehydration, It can be used as a decorative leather substitute. Second Skin could also use the notion of pseudo science as a way of explaining elements that may not be technologically possible. But I hope that the direction of Second Skin does have elements of truth behind it - that the work will question our current need to be connected with technology, to be connected via social media, to look at how far we move with body modification and how far can we go with sustainable textiles. 1Kac, E. (2007). “Life Transformation” Art Mutation. Signs of life bio art and beyond (p. 163). Cambridge, Mass. : MIT Press. https://www.youtube.com/watch?v=3p3-vl9VFYU Suzanne lee on growing clothes.